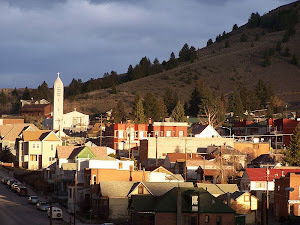 Butte experienced its second mining boom in the teens before and during World War I. The Miner’s Bank is indicative of the healthy economy during these years when copper rose to a high of twenty cents a pound. The Miners Bank and Trust Company was established in 1907, with David J. Charles the first president. David Charles also owned a men’s furnishings store at 905 E. Front Street, and he lived with his wife Lallie at 701 E. Galena. The second bank president, beginning in February 1931, was A.J. Lochrie, husband of artist Elizabeth Lochrie. In 1935, when the state-chartered bank had deposits of $800,000, it was chartered as Miners National Bank of Butte, the second national bank in Butte at that time, but the third national bank in Butte history (see the comment below). The Miners Bank was initially quartered in the Thomas Block at 37-47 West Park Street. On September 1, 1912, fire claimed the original Thomas Block, which housed the Miner’s Savings Bank. Depositors suffered no losses; the bank announced “the vault is standing. The safe is secure and will be opened as soon as it has cooled sufficiently.” The bank immediately planned to build its own building, next door to the Thomas Block, which was also rebuilt. John Shackleton designed and constructed the current building, completed in 1913. A flat roof, decorative brickwork, large display widows flanking three recessed entries, and rows of windows above the street level reflect the high demand for office and living space. A row of concrete “M”s uniquely embellishes the space between the first and second floors. The Bank’s long-time janitor, Robert Logan, was a former slave who was internationally known as a bass singer. The bank occupied a ground floor office until the 1960s; the space was occupied by the Butte Uptown Post Office for years in the 1960s-70s. Upstairs, Lawrence and Katherine Graves were the longtime proprietors of the Miner’s Bank Block Furnished Rooms. In 1930, among their thirty-five lodgers were an architect, an actress, a teacher, miners, and salesmen. Also lodged under the same roof were government prohibition agent Carrol Olson and declared bootlegger Henry Allexis. 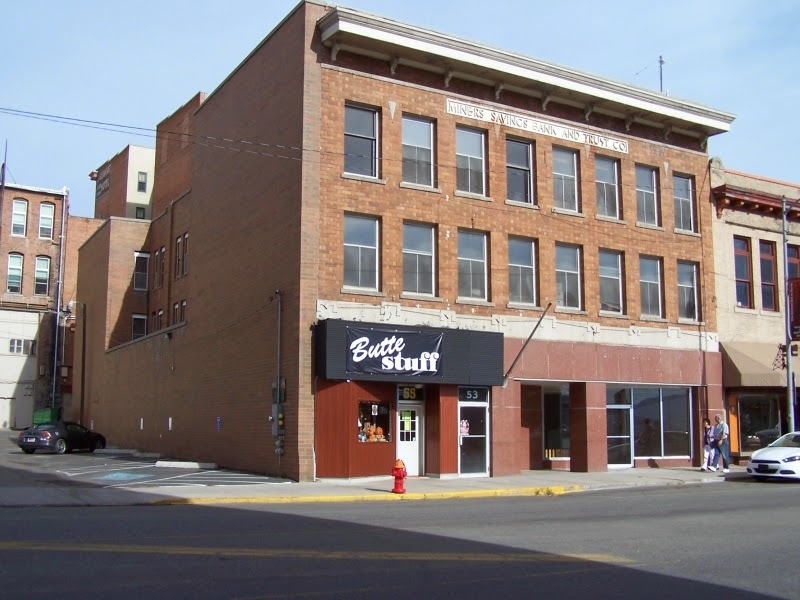 New owners in 2014 have established a Butte souvenir and memento company, Buttestuff, in the western part of the building, and the eastern portion, which originally housed the bank, is the location for the Butte Labor History Center that will open in 2015. Text modified from Historic Plaque by Montana Historical Society. Additional resources: Montana Standard, May 1. 1935; Anaconda Standard, Sept. 2, 1912. Photo by Richard I. Gibson.